Update: the funeral will take place at 4pm on Friday 2nd March, at Preston Crematorium. On Sunday, my dad died. As I mentioned in December, my dad had planned a sponsored expedition to the North Pole, this April, in order to raise money for TransAid, a charity about whose work he was passionate. As part of his training, he was up on High Street, a fell in the Lake District, with his friend John. There, he lost his footing and slipped, falling over a 200 foot precipice. He was discovered to be dead when the air ambulance arrived; almost certainly killed pretty much instantaneously by the fall. My dad, doing what he loved the most: taking on the world and braving the elements. Since then, I’ve been in Preston, where my sisters, our mother, my dad’s partner, and our friends have been trying to come to terms with this tragic loss, and to make arrangements for his funeral. We’re keeping busy, which is probably for the best, right now. I’d like to say thank you to everybody who’s sent cards, emails, or text messages: your thoughts and sympathies are really appreciated, and I apologise that there simply hasn’t been time to reply to you all individually. My dad died doing what he loved: exploring the outdoors, walking, climbing, and pushing his limits, in aid of a worthy cause that meant a lot to him. 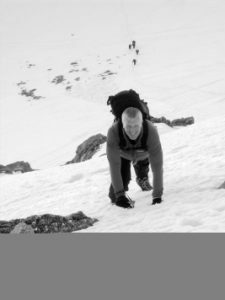 He was in incredible physical fitness, and I’d always suspected that 15 years from now, with him in his 70s and I in my 40s, he’d still have been able to outpace me on a scramble up Helvellyn’s Striding Ridge. I’m sad that that’s a theory that I’ll never be able to put to the test. I’m sad that my dad never lived long enough to see if he’d have any grandchildren. I’m sad that the world is so cruel as to deny us all those conversations left unfinished and those mountains left unconquered. I’m even sad that I’ll never again get an out-of-the-blue call from him on some Saturday afternoon because he can’t work out how to use his printer, or fix his Internet connection. And I still don’t know what to say. So for now, at least, that’s all. Update: Added photo and funeral info. Sometimes, no words are ever enough. But know that my love, and many others love, is with you. If you need anything, whether it be someone to sit with you, or some practical thing to be done, just say. Echoing what Sarah said, you know where I am if you need anything. Instead of sending a card, Lee and I have donated money to the Transaid Peter Huntley memorial. Take care, we will come visit you maybe during the summer but certainly at some point before the end of the year at least! Love and hugs to you and your family. I wish I knew what else to say. Wanted to let you know our thoughts are with you too. Echoing sentiments of all, our thoughts are with you and your family during all of this. We are aware that we haven’t really been in touch but we are only a phonecall/email away at any time. Very sorry to hear about this Dan. So sudden. My thoughts are with you and your family. I obviously can’t imagine how you’re feeling, if you need anyone to talk to you know where I am. How you managed to write that beautiful post I don’t know. Life can be so completely unfair, but in one respect your Dad was unbelievably lucky; in having a son like you. I’m sorry for your loss. Your Dad sounds like an amazing man. This is a lovely post. I didn’t mention in my email the other day how sorry we are for your loss. Our thoughts go out to you and hope to catch up soon for coffee. For some reason the LJ feed I was using to read your blog stopped working, so I’ve only just seen this having randomly stopped by. Please accept my belated condolences – I wasn’t ignoring the news deliberately.